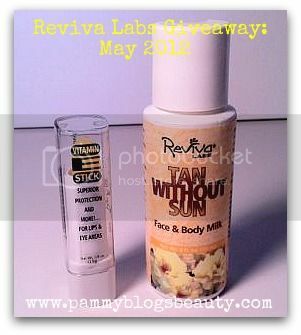 Pammy Blogs Beauty: Six Months of Skincare Giveaways with Reviva Labs: "Tan Without Sun" and "Vitamin E Stick"
Six Months of Skincare Giveaways with Reviva Labs: "Tan Without Sun" and "Vitamin E Stick"
Six months of Spring/Summer Giveaways with Reviva Labs continues!!! Thanks so much to all of you who participated in April's Giveaway. A big congrats to the the April Giveaway winner Pollarbelle! Be sure to check out her awesome blog!!! For those of you just joining this series, Reviva Labs is offering 6 months of skincare giveaways for Pammy Blogs Beauty readers. I am a huge fan of this brand. So, I am happy that some of my readers will get to try it too! Reviva Labs is a clinically-based skincare company that is also environmentally conscious. The products are well-tested, researched, and results-driven. The packaging is non-descript and the items are most commonly found in natural foods stores; but, I have also seen Reviva Labs recently at Ulta and at my local grocery store. I continually get great results with Reviva Labs products. Curious as to some of my previous Reviva Labs reviews? Be sure to check out: Expectant Mama Skincare Review, Expectant Mama Skincare Review (part 2), Reviva Labs Gentle Smoothing Cleansing Gel, Reviva Labs Vit E Stick, and Reviva Labs Makeup Primer. Month Four (July): Light Skin Peel and Hydrogen Peroxide & Seaweed Soap. This Giveaway is for the "Tan Without Sun" self tanner and the "Vitamin E Stick". The Vitamin E Stick I have previously reviewed (and love). I will review the "Tan Without Sun" for you today. Keep reading for how to enter the giveaway and for the Tan Without Sun review! I am so excited to finally be using self-tanner again!!! I avoided/limited using self-tanners last Spring and Summer because of pregnancy. So, I am thrilled to be able to self-tan again! My skin is super-duper fair. I have a hard time tanning in the sun without burning. Plus, who wants all that sun exposure anyways? Not me! Skin Cancer runs in my family and I have lost a friend to Melanoma. Sun protection is serious business! Since I protect myself against the sun, self-tanners are really the only way I get "color". Self-tanners actually give me a better looking tan than the sun without the skin cancer risk and the redness and potential burning. Tan Without Sun is a great self-tanner option! It is a DHA (Dihydroxyacetone) based self-tanner. DHA is the ingredient that interacts with proteins in your skin's surface to products a natural-looking tan in about 3-4 hours. Tan Without Sun can be used on your body or your face. At first I thought that this was a gradual tanner. But, I was wrong! This is a regular strength self-tanner. With that said, the results are a light/subtle tan. I found that the color produced looks quit natural and not overly "orange" (this is a good thing! So many tanners turn me orange; but, not this one!). :) The tan produced lasts about 4 days and gradually fades. Tip: For best results always exfoliate before use of this product. Your resulting tan will be much more even. Pay special attention to exfoliate the ankles, knees, and elbows. Also, I apply a bit of regular lotion to those areas before self-tanner application. Color tends to cling to those areas otherwise. And now...on to the Giveaway Details! The Prize: One winner will get the "Tan Without Sun" self tanner and the "Vitamin E Stick". Contest ends on midnight June 1st. 4. Answer question in comment form below: "What is your must-have beauty product for Summer?" Thanks so much for participating in this Giveaway! I appreciate the love and support from all of my wonderful readers! So, it is a pleasure to host a Giveaway for you all! Self-Tanner is my must have! I'm soooo pale--so I need to get some color--but safely! Lightweight moisturizer with SPF built in. Ole Henriksen is a fave! Both sunscreen and a tanning lotion. I'm very fair-skinned. definitely sunblock, esp. as I get older! My must have all year is lip balm.